This child just makes me giggle. This is her Eek A Bug! reaction. It doesn’t matter if it’s a fly, a bee or even her most feared and dreaded insect of all…the ladybug. Her little hand covers her head. And with the warmer weather and being outside at baseball games we’ve been seeing this a lot. I’ve been saving this sheet of My Mind’s Eye paper from the Noel Mignon Melrose kit not wanting to cut it. I just adore the color and pattern, so I thought it would be perfect as the base for my oversized picture. I added a sheet of pink flowers to draw out the colors of the flowers on her shirt and her pink chubby cheeks. Apparently running from bugs is a hot job. If anyone has a tip to get a rather large wasp-like bug or two or three out of the house, I would greatly appreciate it. This kiddo is just beautiful… and those ladybugs are highly fierce so understand. LOL As always, your projects are so fresh and clean and modern. I love that about your style! This is one adorable layout! You used in this layout!!!.. Love this layout. The papers are a nice background to the adorable picture of Hartley. She is adorba;e and so is that LO! 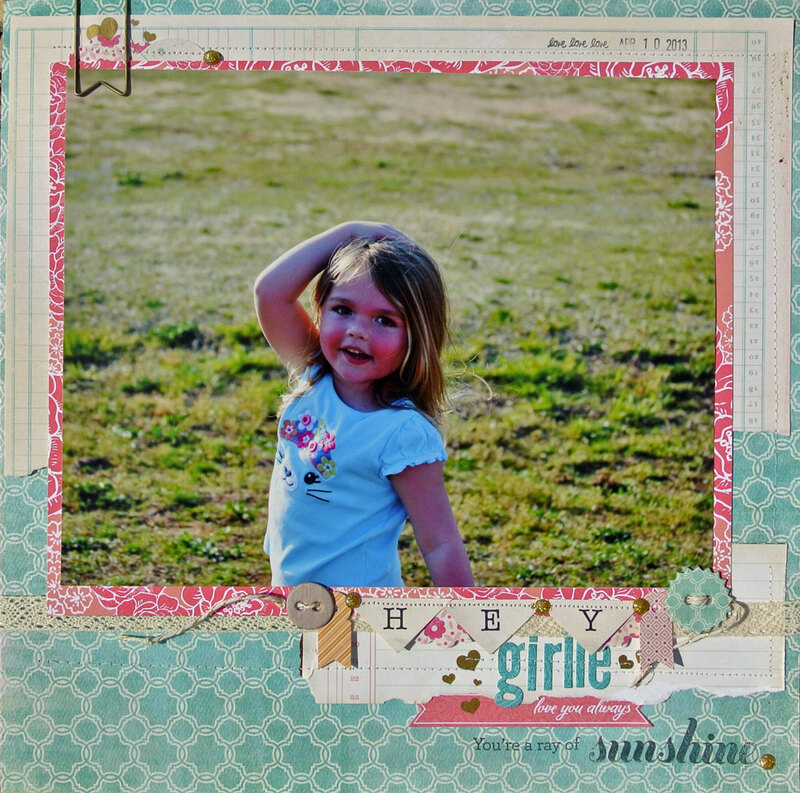 Sweet little girl, ‘buggin’ story, and a wonderful layout! Thanks for sharing your heart!